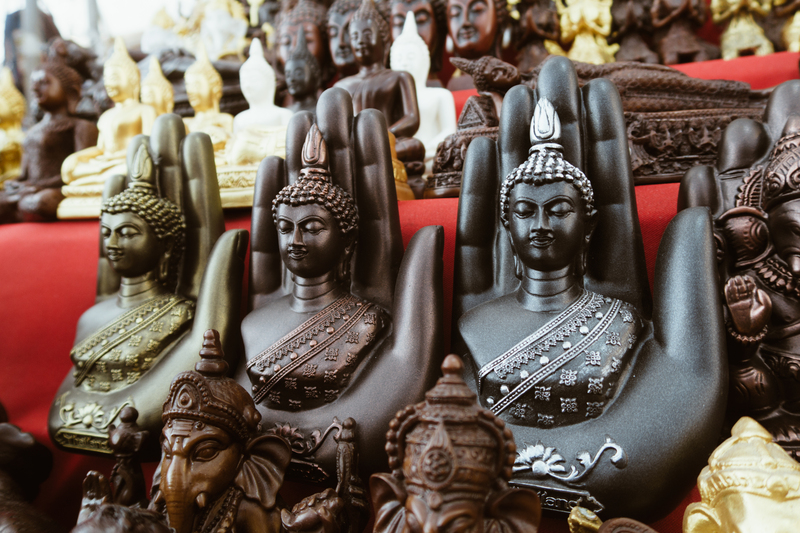 What if you only have 18 hours in Bangkok? What will you do? All the way from our Bali trip last January, me and Ralph decided to take a flight with a long layover to Bangkok before going back to Dubai. 7 Pm: Arrived at Suvarnabhumi airport. 1 hour queue in Immigration. Grabbed our pocket wifi which we booked from Klook. (This was super handy! Most specially if you’re DIY-ing a trip and trying to look for directions on your own: Google Maps is your best friend.) Then we took a cab from the airport. The driver doesn’t speak English at all. We felt powerless but just went with the flow and trusted him. We basically just showed him the address on my phone and the photo of the hotel while we also help him via Google Maps! Gladly, just after an hour, we reached our hotel. 9PM: Reached the hotel. We booked Salil Hotel Sukhumvit Soi 8 via booking.com prior our trip for around 200 dhs ($55). The rooms are a bit small. It was close to Sukhumvit main entertainment and BTS station. Sadly, our room has bed bugs :(((. First thing we did when we entered our room was hit the bed cos we’re too tired but then after a few minutes we suddenly became itchy and that’s when we decided to check the bed and yep first time I saw a bed bug up close and personal. Cut the story short, we asked for a new room. To be fair, the staffs were really polite and friendly. 10PM: We just freshened up and went out to look for a place. Highest rated on tripadvisor nearby was Cabbages and Condoms. 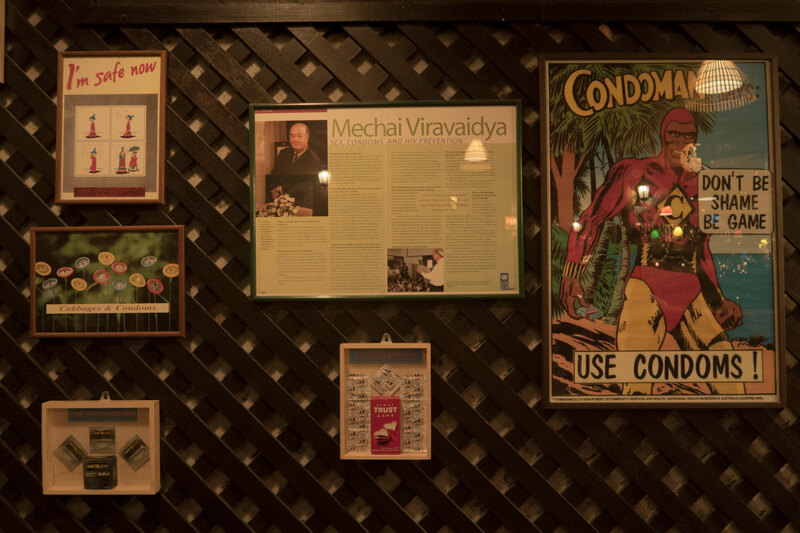 Apparently it was established by a gentleman who was trying to create awareness of using condoms for family planning as well as health and well being (AIDS awareness). 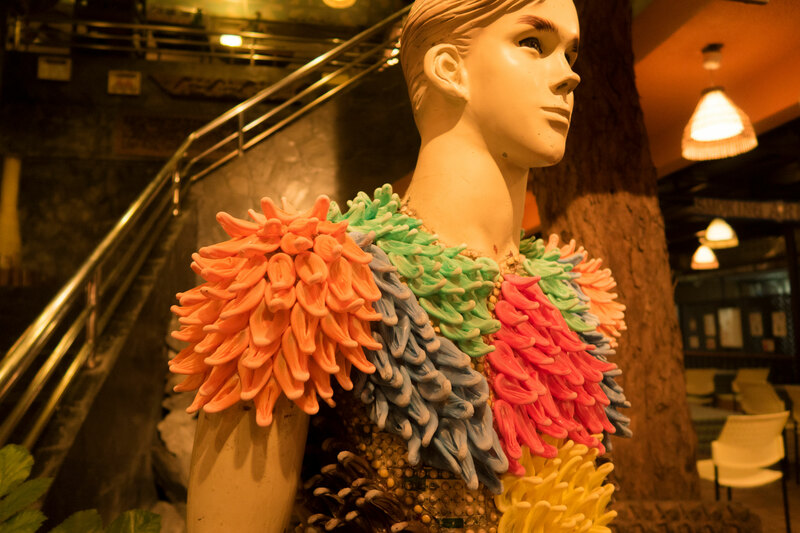 He set up this restaurant with a theme of condoms so as soon as you go in you will find mannequins wearing clothes made up completely of condoms, condom chandeliers or even a Christmas tree made up of condoms. Food and service is good too. It arrived quickly after we ordered. I ordered the thai milk tea while Ralph had the Singha beer. 11PM: After dinner, I forced Ralph that we check Thailand’s Red light district (he’s so not into it lol. 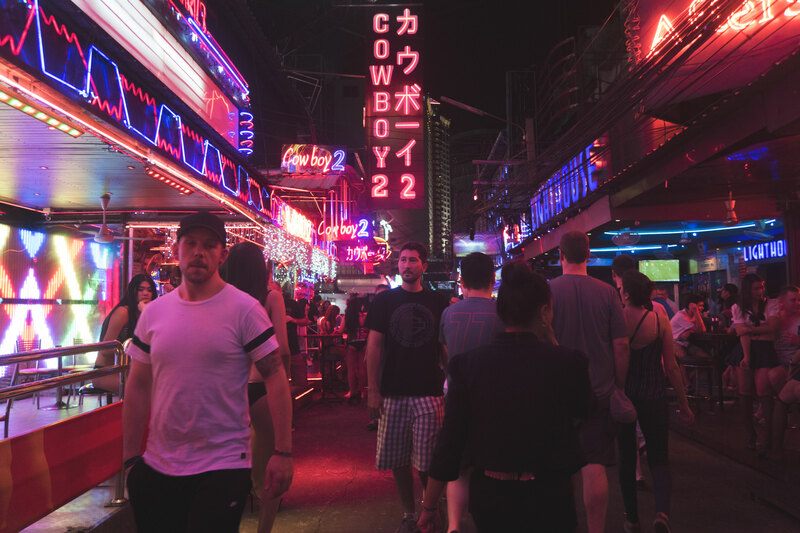 ), so we went to Soi Cowboy. It’s just walking distance from Cabbages and Condoms. We literally just went people watching. What can I say, think of Hangover Part 2. It’s a typical red light district – lots of booze, strip clubs, ladies (? )(in bikinis) and men. Plenty of ladies (and ladyboys, I couldn’t really tell them apart) trying to make people visit the bars which offer shows. 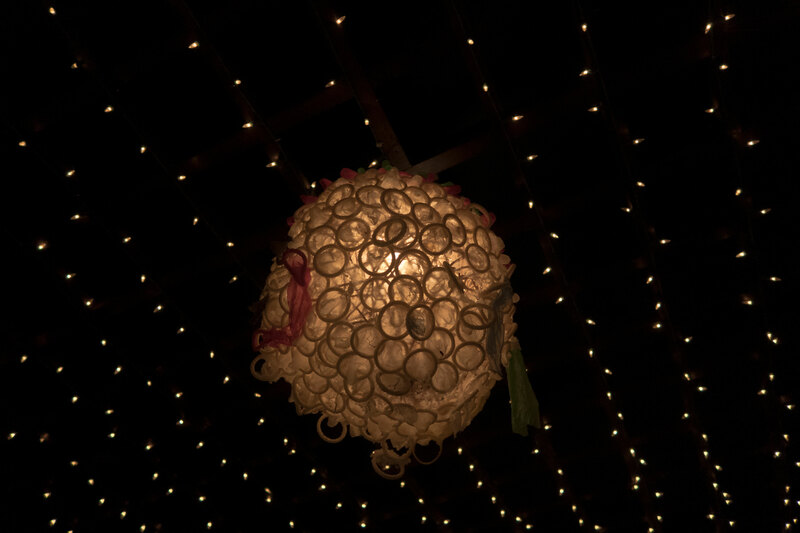 I think it’s worth visiting if you are open minded and you’re curious about Bangkok’s night scene. I don’t think you have to go into the bars, just walking down to the whole street, people watching is an experience itself. 12AM: Went back to hotel. Rest. 7AM: Woke up early because we had to make the most out of this day since our flight going back to Dubai is at 3pm. Ate breakfast at hotel. Then we booked an uber going to the Chao Praya Express Boats. I’ve read on TripAdvisor that this is the best way to get around the temples in Bangkok. 9AM: We arrived at the Boat Station and we booked the hop on, hop off ticket as we think it’s the most convenient for us. 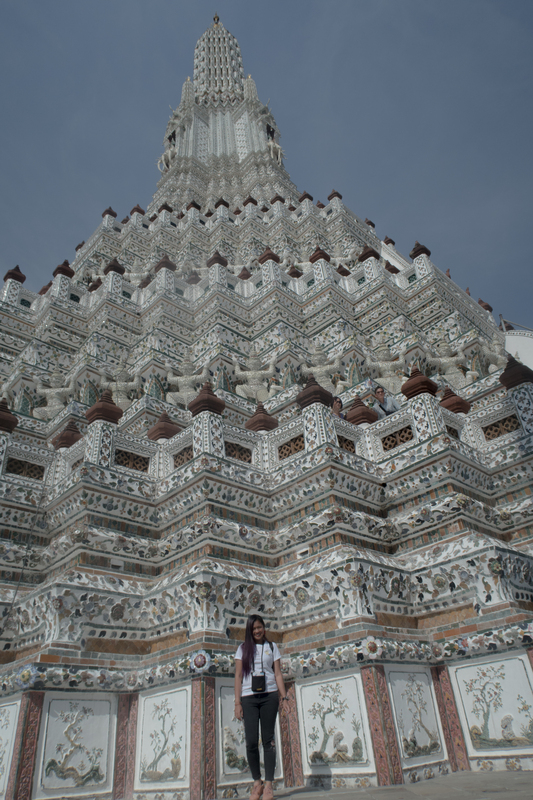 10AM: Our first stop is Wat Arun or The Temple of Dawn. This place is just wow. I highly suggest visiting this place on a weekday cos when we went it’s a Saturday and there were just loads of people. It didn’t stop me from appreciating the beauty of this temple though. 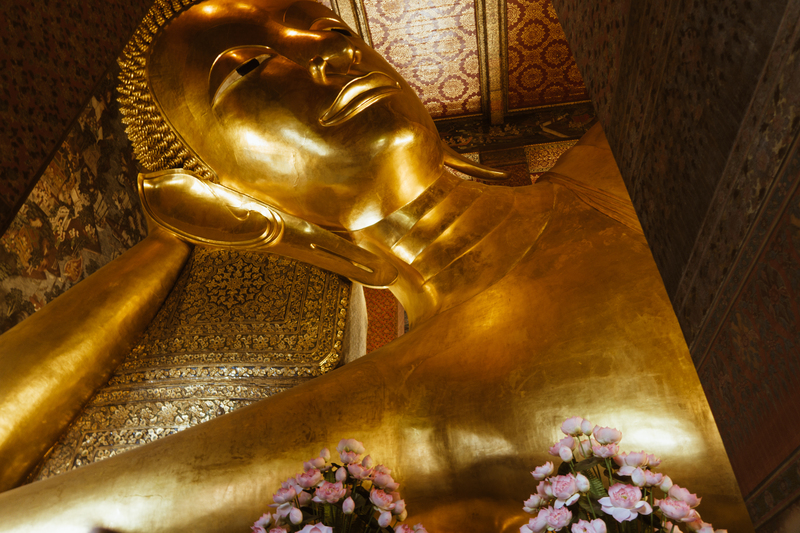 It’s a must visit when you’re in Bangkok. 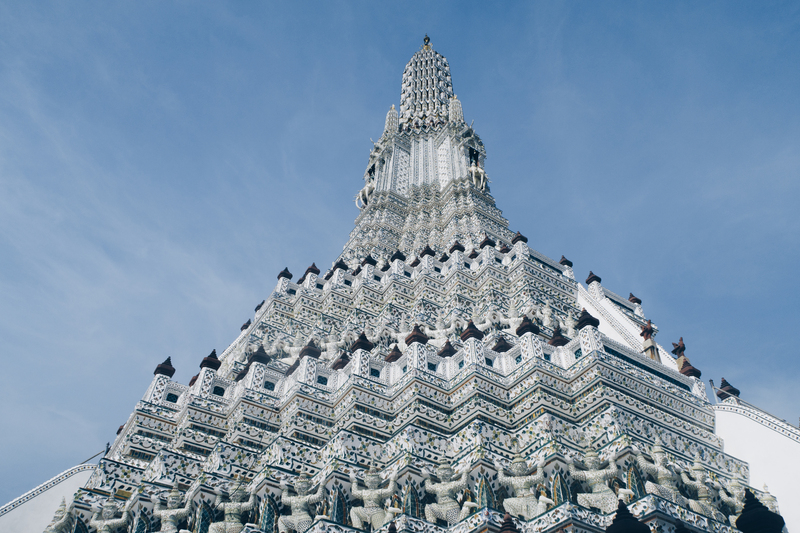 The details of this temple are just mesmerizing. Also, if you have spare cash, make sure to try on the traditional dance costumes for a fee. You may also buy some souvenirs inside. I gained 5kg because of this trip. lol. Please bear with me. I really don’t know what I am doing. I just really want to try the dress and the crown. haha. Ralph and I were super burnt. lol. 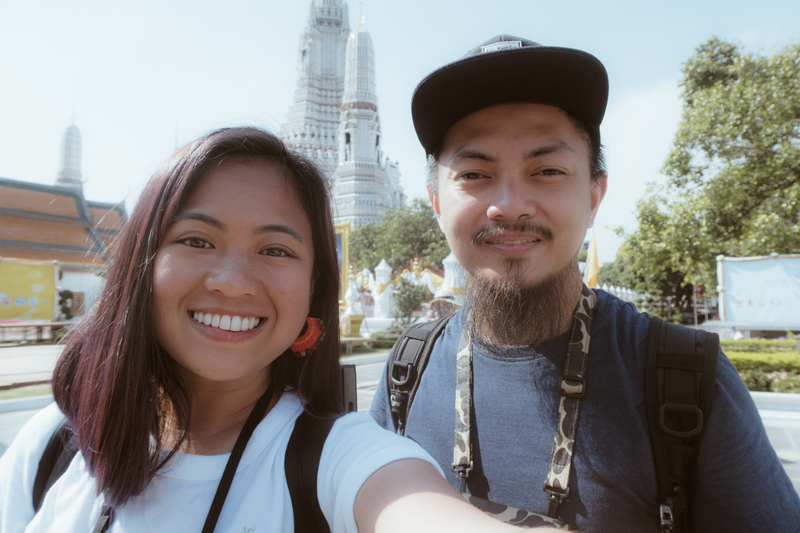 11AM: After Wat Arun, we hopped on the boat again going to China Town where the Wat Pho or Temple of the Reclining Buddha is located. 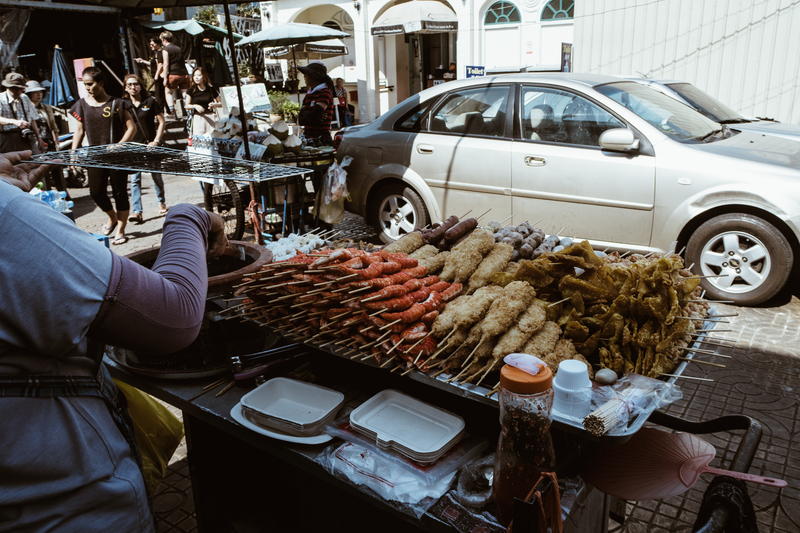 On our way to Wat Pho, we saw lots of thai street foods. 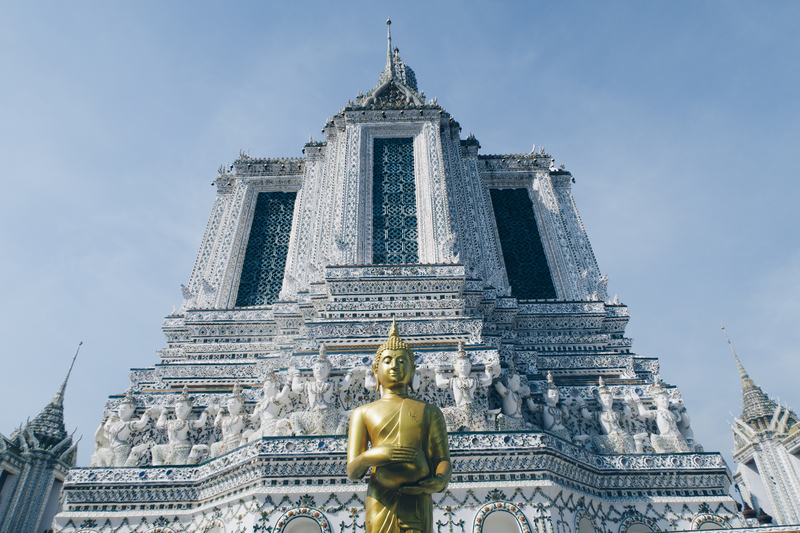 Once we entered the temple, we noticed there were lots of people so you have to queue in order to get a photo of it. It was really hot that day but the good thing is the entrance fee comes with a free bottled water. 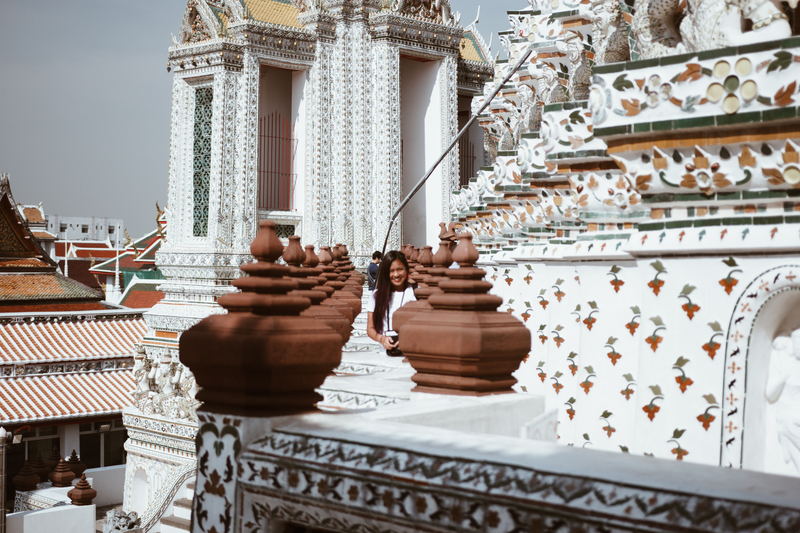 The Wat Pho is so huge that is really hard to take a full photo but it was a sight to behold and totally looks better in person than in photos. 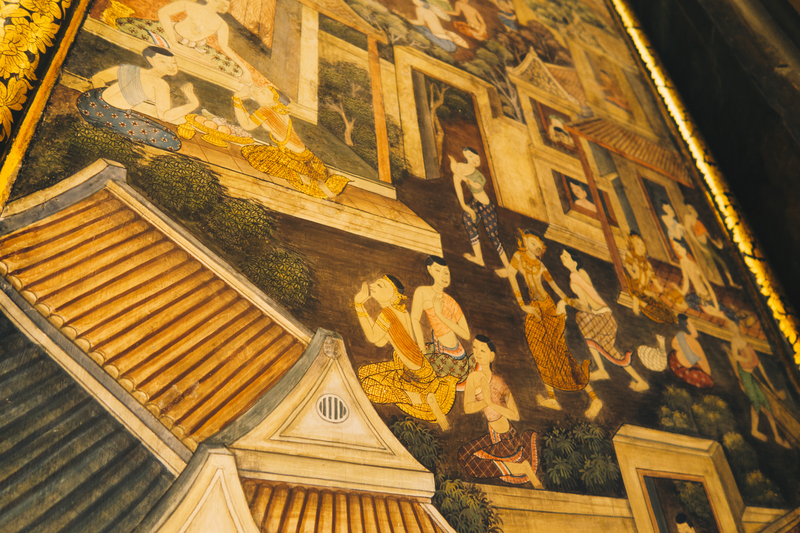 12PM: From Wat Pho, we’ve decided to take a tuktuk going to the Grand Palace. Make sure to haggle and do your research about the cost before riding a tuktuk cos some drivers will rip you off especially if they know you are a tourist. 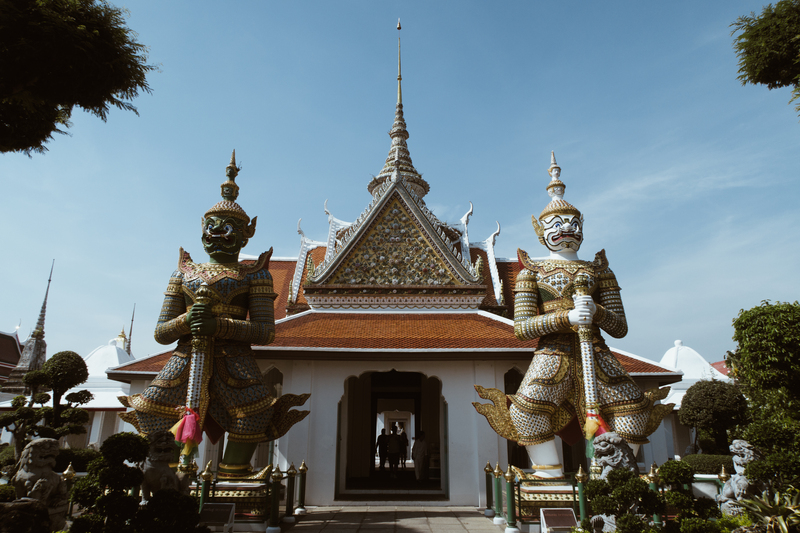 Unfortunately, we weren’t able to go inside the Grand Palace because Ralph was wearing shorts and they don’t allow it, even a sarong or a wrap around skirt won’t do. 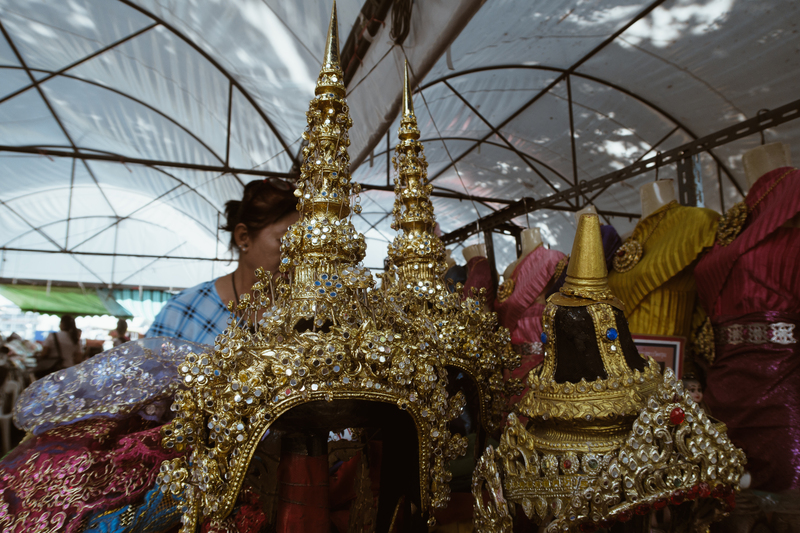 Most people are forced to buy clothes from vendors on the street across the grand palace which are really so expensive. As much as we want to go inside, we really didn’t bother since it was really crowded as well and we didn’t want to spend much for a disposable pants. I guess there’s always a next time. This concluded our short trip to Bangkok as we had to go back to the hotel, get our stuff and then travel to the airport for our 3pm flight. Bottled Water, handkerchief or face towels, tissue papers and hand sanitizers are necessary. Make sure you try the Pad Thai, Thai Milk Tea and Mango Sticky Rice!